Escape to the world of cats! Imagine your backyard is full of cats. 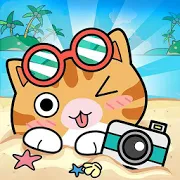 Play on cat collecting adventure and searching all treasures in The Cats Paradise to unlock special features, such as album theme, background theme, and more. Share your good time in Facebook timeline through your cat’s photo. You can play The Cats Paradise anytime, anywhere, even when not connected to the internet. Best of all, the world’s most relaxing game is free to play!